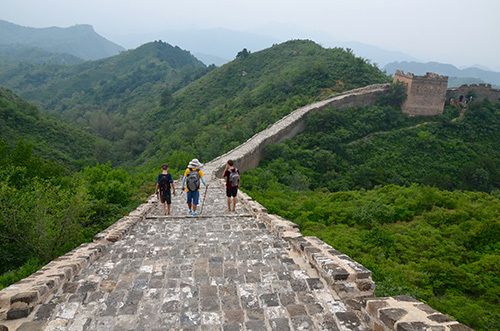 There is no better way to explore China&apos;s Great Wall than by hiking or walking along it. Tread the centuries-old bricks and walk through watchtower ruins. Take your time and feel the history come to life. We understand that you want a top-notch hiking experience and we will present you with the best hiking tours and tips here to help you have an enjoyable Great Wall hike. The history will come alive for you with an expert guide. In short, if you love a hiking trip with no hassle, no disappointments, and pleasant surprises, you will love our tours and tips. There are about nine sections of Great Wall around Beijing. We understand that you probably won&apos;t want to hike all of the sections so we have recommended these two best routes for you to consider due to their scenery, the hiking experience needed, and the accessibility. This route is also called Jinshanling Great Wall hiking. It is definitely the best hiking route if you want to see the original Great Wall including some ruined sections as well as some fabulous scenery that includes the wall snaking along the mountain ridges into the distance. This is a totally wild hiking trip. 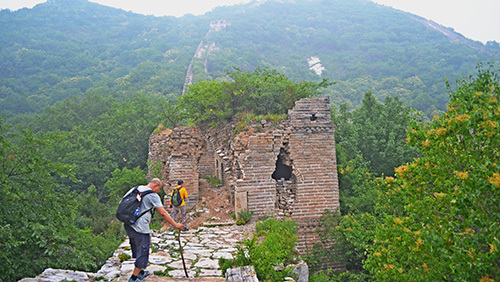 You will trek on the Great Wall ruins along the mountain ridges. It is challenging — on the way, you need to climb wooden ladders, step over piles of stone blocks, weave around trees growing on the wall, and descend a 50-degree slope on the wall. The experience will be extraordinary. When you reach the mountain ridges, you&apos;ll have a panoramic view of the wall snaking along the sheer peaks. What&apos;s more, there are no crowds around you — it&apos;s just you, the mountains, the ruined wall, your guide, and the history behind these ancient wall ruins. 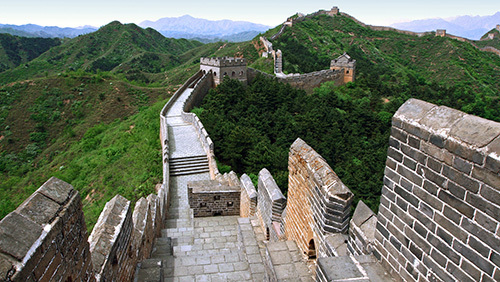 Our Great Wall hiking tours are private. There are no strangers with you. You can travel at your own pace, giving you plenty of time to take great photos or just to feel the majesty of the wall at certain places. Our hiking itineraries can be customized, which means your travel advisor can help you make the tours unique to suit you. 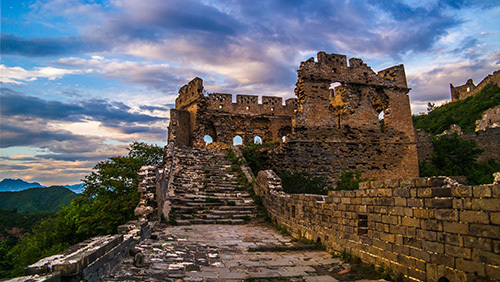 1-Day Jinshanling Great Wall Hiking Tour Hiking on the well-preserved original wall at Jinshanling, you will be rewarded with the most beautiful Great Wall scenery. Hike at your own pace and enjoy the Wall to the utmost. 1-Day Jiankou to Mutianyu Great Wall Hiking Tour Hike the wild and most precipitous Great Wall at Jiankou. Enjoy the thrill of steep ascents and descents on the ruined Wall. With no tourist groups around you, you can enjoy having the wall all to yourself. 3-Day Discovery Great Wall Hiking from Jiankou to Jinshanling Appreciate the bleak but picturesque scenery of the wild Great Wall at Jiankou, and the authentically restored glory of the Mutianyu and Jinshanling sections. 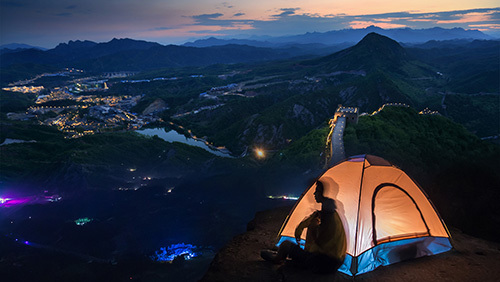 2-Day Private Great Wall Camping Tour Camp on the Great Wall at Huanghuacheng and experience the Great Wall in the silence of the night. Let the vivid history of the Wall permeate your dreams. Enjoy a once in a lifetime experience. 5-Day Great Wall Hiking from Huangyaguan to Huanghuacheng Enjoy a week-long Great Wall hiking trip. Hike on five Great Wall sections including the wild and ruined sections, half-repaired sections, and fully-restored Wall. Sleep in the ruins of an ancient watchtower on the wall just like soldiers once did in ancient times. Experience the wall during the silent night and let the stories behind it come into your dreams. #1 Can anyone do the Great Wall hikes? Customers from 5 years old to senior couples in their 70s have hiked on the Great Wall with us. So the key factors are how fit you are and what the weather conditions are like. Some rugged and steep sections are challenging but your private guide is patient — if you need more time then so be it! Free trekking poles are also available. #2 What are the trail conditions like? There are dirt paths, steps, and trails covered with fallen leaves, paved sections, a few sections with loose bricks and small stones, and partly repaired or fully-restored sections to original and crumbling ones. Generally, the condition is a pleasant surprise to most customers. We recommend you use walking boots that offer support and protection from loose bricks or rocks that your feet might kick. It is best to have non-slip soles in case of rain. #3 Which wall sections are best to see a sunrise and sunset from? The best wall section to see both a sunrise and sunset from is Jinshanling. You need to stay for one night at the foot of the wall if you want to see a sunrise. The Mutianyu section is also a good choice to see a sunset. #4 Will your guide hike with me? Yes, your guide will hike all the way with you. He/she will help you take photos, tell you the best location for photos, and give you information about the wall. #5 At which section can I see both ruined and repaired walls? The Great Wall at Jinshanling is half repaired. You can see both a repaired section of wall and the original wall in ruins. This section also has the most beautiful natural scenery. Many professional Great Wall photos are taken at this section. #6 When is the best time to hike the Great Wall? You can hike on the Great Wall all year round except for when it is snowing and the roads become slippery. There is no defined best time, as the best weather/scenery also means the most crowds. An experienced travel specialist will make your experience more pleasant whatever the weather. If you would rather hike during the best weather conditions, May/June and September/October will be the best times to hike. #7 Is it possible to take a Great Wall hiking tour from Beijing airport? Yes. If you travel with us, your guide and driver will pick you from the airport and drive you to the Great Wall (usually the Mutianyu section because it is quickest to get to from Beijing Airport, but, if your time allows, we can arrange for you to visit other sections). Read about our one-day Great Wall hiking tour from the airport. #8 How to make Great Wall trips more interesting? 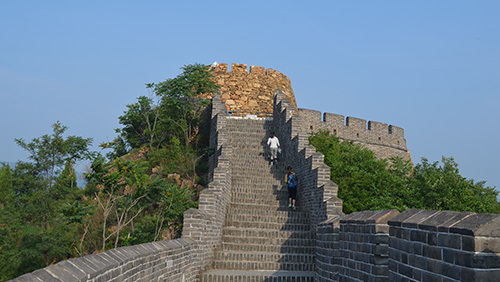 Various activities can make your experience more interesting, such as hiking the Great Wall at night, camping on the wall, and challenging yourself by taking a wild hike. Don&apos;t forget that your experienced guide will help the wall&apos;s vivid history come to life for you. 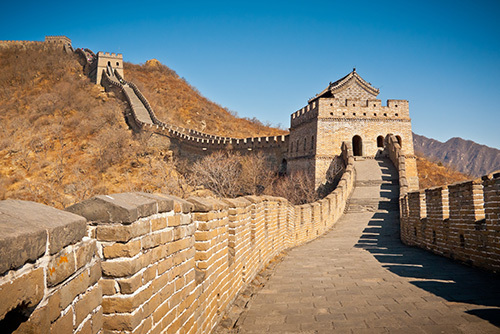 #9 Is it possible to hike the entire Great Wall of China? Yes, it is possible. However, it takes years to cover the 13,000+ miles of the entire wall. It took Stephen Robert Loken of Norway, aged 42, 601 days to hike the entire Ming Dynasty (1368–1644) Great Wall, which spans 3,728 miles (6,000 kilometers).